Rotary District 3190 is organizing its Second Annual Karnataka CSR event on 15th Feb 2019 in Bangalore. This conference is to celebrate the contribution made by various stakeholders towards community service in Karnataka for socio-economic development of this State. The conference will ideate on the Rotary’s six areas of focus to build international relationships, improve lives, and create a better world to support our peace efforts and end polio forever. 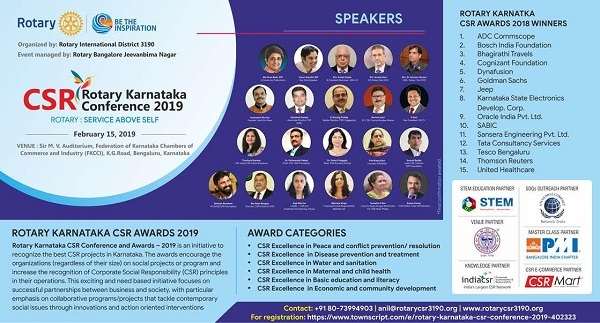 Rotary Karnataka CSR Awards - 2019 is an initiative to recognize the best CSR projects in Karnataka. The awards encourage the organizations (regardless of their size) on social projects or program and increase the recognition of Corporate Social Responsibility (CSR) principles in their operations. This exciting and need-based initiative focuses on successful partnerships between business and society, with particular emphasis on collaborative programs/projects that tackle contemporary social issues through innovations and action-oriented interventions.